Northern giant portrait, profile, head detail. The distinctive tube nose (naricorn), characteristic of species in the Procellariidae family (tube-snouts), is easily seen. Nellie Photo. 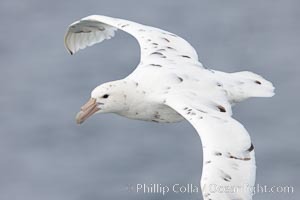 White nellie, the white morph of the southern giant petrel. 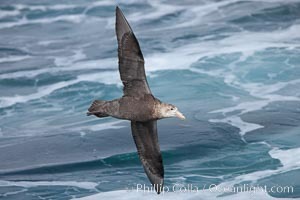 Southern giant petrel in flight. Nellie Picture. 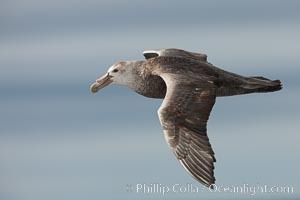 Southern giant petrel in flight. The distinctive tube nose (naricorn), characteristic of species in the Procellariidae family (tube-snouts), is easily seen. Stock Photography of Nellie. 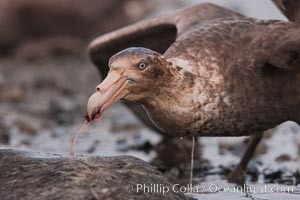 Northern giant petrel scavenging a fur seal carcass. 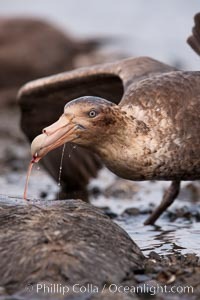 Giant petrels will often feed on carrion, defending it in a territorial manner from other petrels and carrion feeders. Photograph of Nellie. 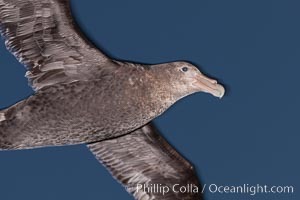 Southern giant petrel in flight at dusk, after sunset, as it soars over the open ocean in search of food. Nellie Photos. 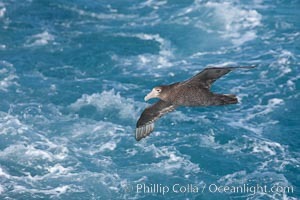 Southern giant petrel in flight. The distinctive tube nose (naricorn), characteristic of species in the Procellariidae family (tube-snouts), is easily seen. Nellie Image. 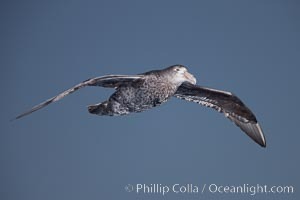 Northern giant petrel in flight at dusk, after sunset, as it soars over the open ocean in search of food. Professional stock photos of Nellie. 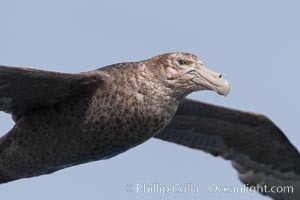 Southern giant petrel in flight. The distinctive tube nose (naricorn), characteristic of species in the Procellariidae family (tube-snouts), is easily seen. Pictures of Nellie. 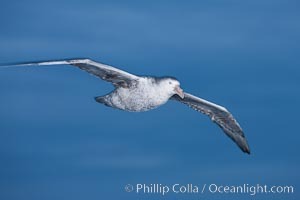 Southern giant petrel in flight, soaring over the open ocean. This large seabird has a wingspan up to 80" from wing-tip to wing-tip. Nellie Photo. 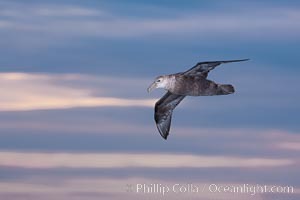 Southern giant petrel in flight at dusk, after sunset, as it soars over the open ocean in search of food. Nellie Picture. 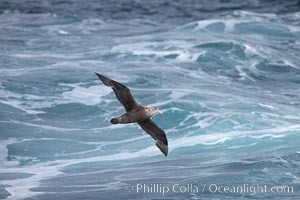 Southern giant petrel in flight, soaring over the open ocean. 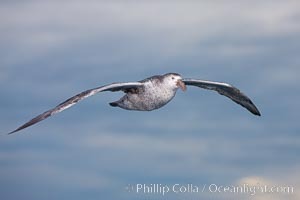 This large seabird has a wingspan up to 80" from wing-tip to wing-tip. Stock Photography of Nellie. 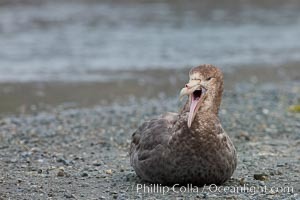 Northern giant petrel, opening beak, sitting on pebble beach. Nellie Photos. 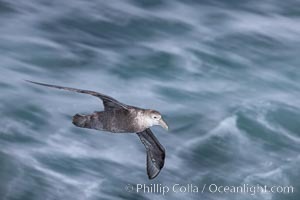 Northern giant petrel in flight at dusk, after sunset, as it soars over the open ocean in search of food. Nellie Image. 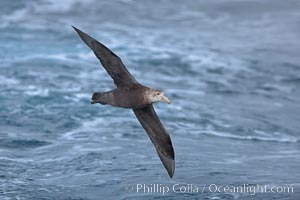 Northern giant petrel in flight. The distinctive tube nose (naricorn), characteristic of species in the Procellariidae family (tube-snouts), is easily seen. Professional stock photos of Nellie. 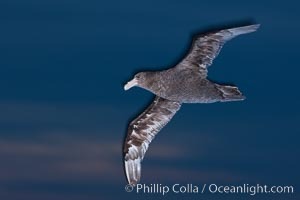 Southern giant petrel in flight at dusk, after sunset, as it soars over the open ocean in search of food. Pictures of Nellie. 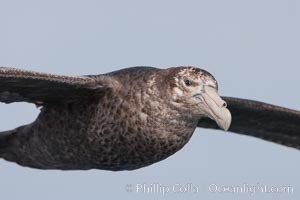 Southern giant petrel in flight. The distinctive tube nose (naricorn), characteristic of species in the Procellariidae family (tube-snouts), is easily seen. Nellie Photo. 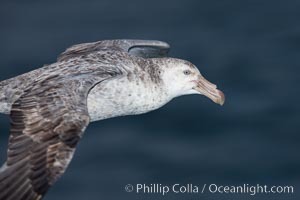 Southern giant petrel in flight, soaring over the open ocean. 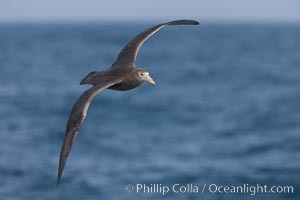 This large seabird has a wingspan up to 80" from wing-tip to wing-tip. Nellie Picture. 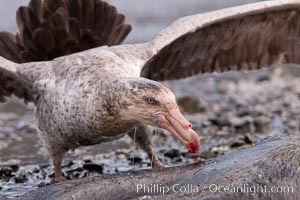 Northern giant petrel scavenging a fur seal carcass. 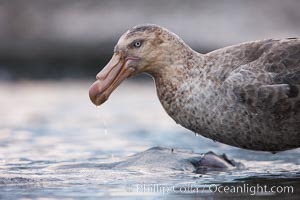 Giant petrels will often feed on carrion, defending it in a territorial manner from other petrels and carrion feeders. Nellie Photos. 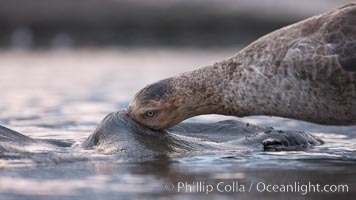 Northern giant petrel scavenging a fur seal carcass. 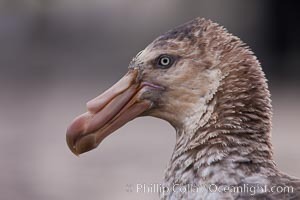 Giant petrels will often feed on carrion, defending it in a territorial manner from other petrels and carrion feeders. Nellie Image. Southern giant petrel in flight at dusk, after sunset, as it soars over the open ocean in search of food. Professional stock photos of Nellie. Southern giant petrel in flight at dusk, after sunset, as it soars over the open ocean in search of food. Nellie Photo. 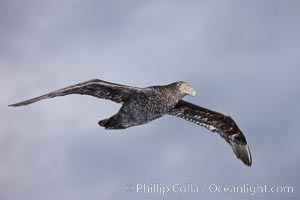 Southern giant petrel in flight. The distinctive tube nose (naricorn), characteristic of species in the Procellariidae family (tube-snouts), is easily seen. Nellie Picture. 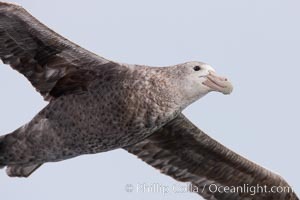 Southern giant petrel in flight. The distinctive tube nose (naricorn), characteristic of species in the Procellariidae family (tube-snouts), is easily seen. Photograph of Nellie. 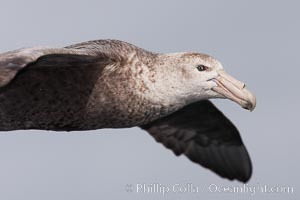 Southern giant petrel in flight, soaring over the open ocean. 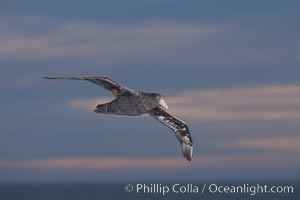 This large seabird has a wingspan up to 80" from wing-tip to wing-tip. Nellie Photos. 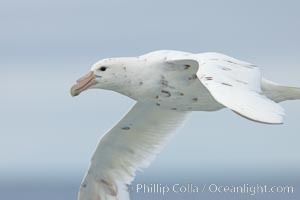 White nellie, the white morph of the southern giant petrel. 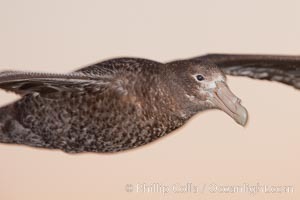 Southern giant petrel in flight. Nellie Image.